The oak lives right across the street from me. The palms live across the intersecting street from the oak. From my yard, I can frame the sunset between them. 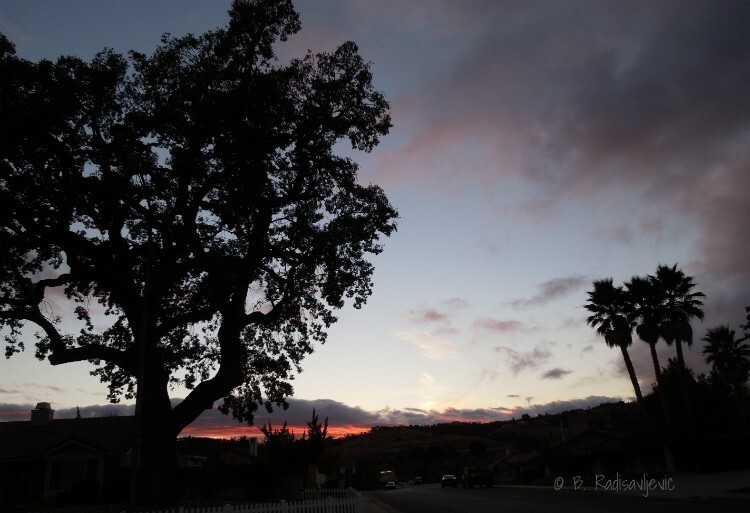 My only frustration when photographing the sunset in this frame of trees is the streetlight in front of the oak. It's a bit darker in this photo. 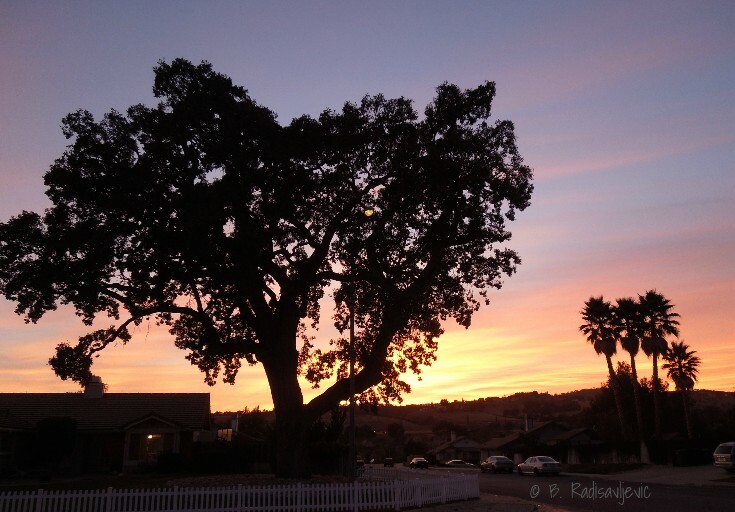 As often happens, in order to get the sunset shot I want, part of the oak gets cut out. Sometimes the oak solos in the photos. Sometimes the palms stand alone. Of course, there are many other reasons I love trees. They provide shade in summer, turn carbon dioxide into oxygen, provide tasty fruits to eat, and turn lovely colors in the fall. In winter blooming trees provide beautiful reminders that spring is coming soon. They provide places for birds to nest and perch. What's not to love about trees? Okay, I do know they drop unwanted seeds in the fall (but the squirrels and birds love them.) Sometimes they drop messy fruits. Raking those lovely colored leaves in autumn is a tradition I like much better than those horrible noisy blowers too many people use now, but I understand that some people consider raking or blowing leaves a chore. I personally think the pros of growing trees far outweighs the cons. Our lives would be much poorer without them. 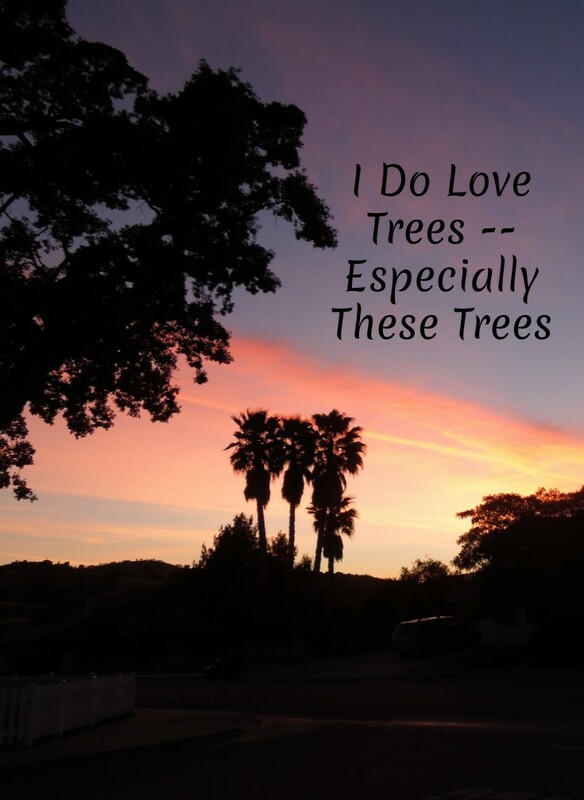 What do you love most about trees? Which trees do you like best? 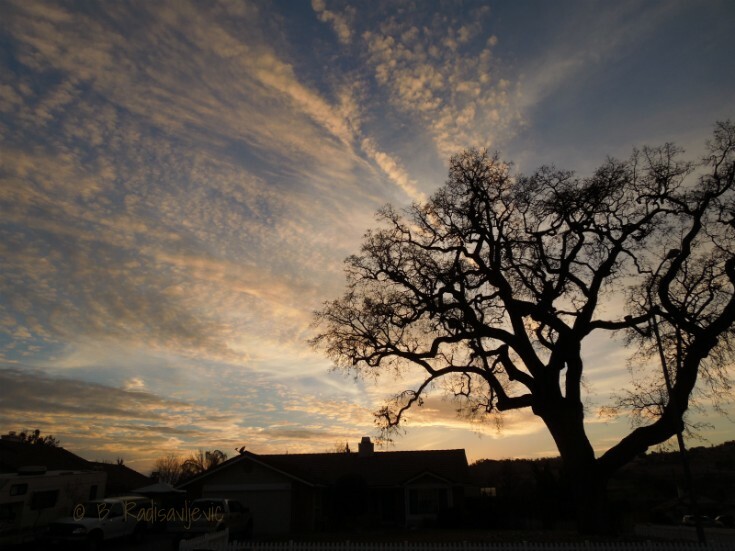 Do you have a favorite tree that means something special to you? Please share your thoughts in the comments. 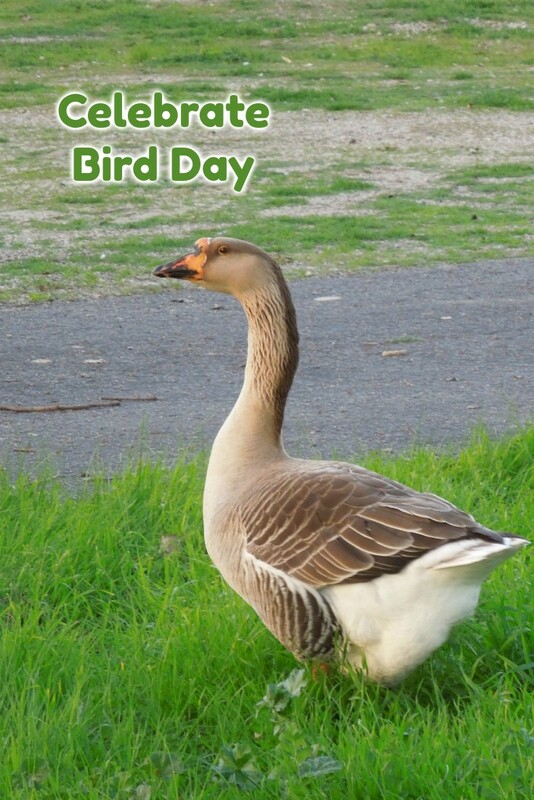 How Will You Celebrate Bird Day? I celebrate birds every day. Do you? Here's why I celebrate birds. They fill our world with song. They eat insect pests in our gardens. They are fun to watch in the wild and in our yards. They hunt rodents that damage our gardens and crops. Take a walk and see how many different kinds of birds you can spot. Try to capture them on camera. Make a video of their songs. I personally use two cameras. Both give me half an hour of HD video if needed. My Canon PowerShot SX410 IS features a 40X optical zoom. That is very important when capturing birds that go high in trees. I also use an obsolete Nikon CoolPix that's smaller and will fit in a pocket. Fortunately for me, both cameras fit nicely in the shoulder case featured in the PowerShot bundle below. It's really handy to always have both cameras and extra batteries and SanDisks along, and they all fit in the bag with my ID and other small things I need. If you aren't a photographer, you may want to take along binoculars. A good pocket field guide is also nice to have along. 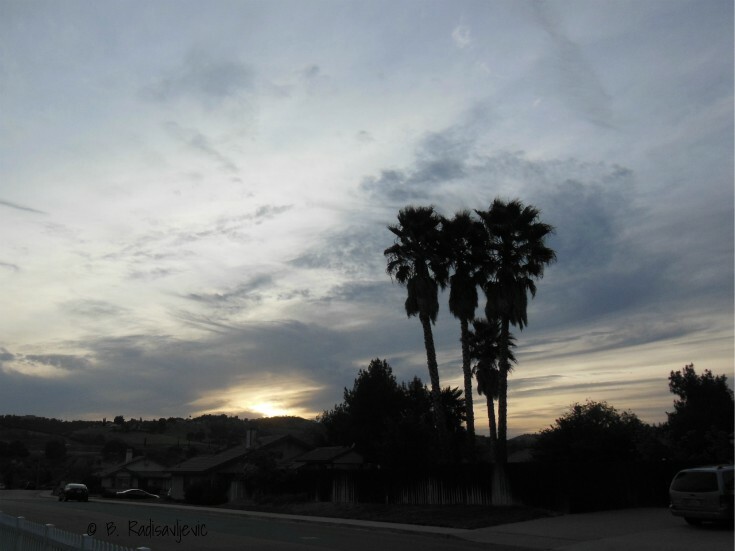 Use an editor like Fotojet or PicMonkey to make a collage. Both have free versions. I use the premium versions of both because I think it's worth paying for the extra features they provide. I also like to make products at Zazzle for fun and profit. Here are some of the gift items I've made that feature birds. I confess I haven't done this yet, but I want to. Many of my friends love watching the birds flock to their backyard feeders. Some even keep a special camera to watch them and play back the video later. If you don't have a bird feeder yet, the selection may overwhelm you. Here are a few of the most popular. Birds appreciate water. Sometimes when I've been working in the garden with the sprinkler on the birds fly through the water just as children run through sprinklers. Birds need water, and it's not always easy for them to get during a hot summer. I've wanted a bird bath for a long time, but so far I haven't found the right place for it. I do admire those my neighbors have when I walk by them. So do the birds. 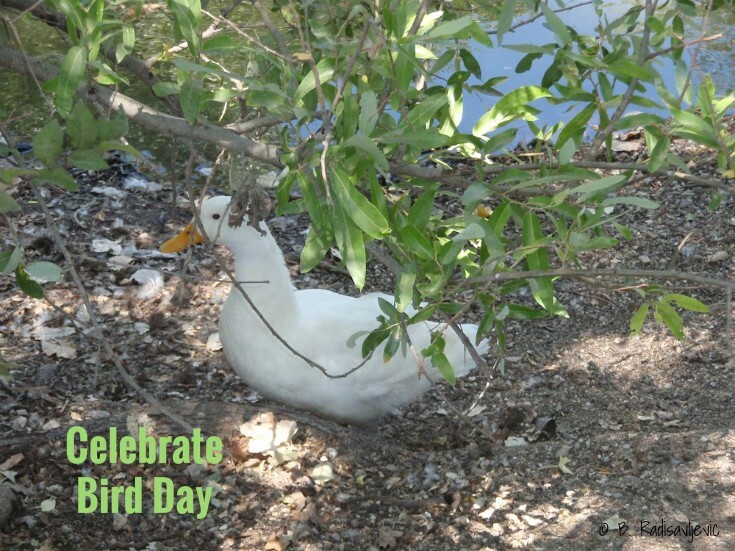 How Will You Celebrate Birds? However you do it, get the whole family involved if you can. Whether you watch birds in the wild or in your backyard, enjoy them. Learn to recognize them by their looks and their calls and songs. Feed them if you are so inclined. As you can probably tell my photos, I like to watch birds in and around the water. I see many other birds, but the waterfowl are the easiest for me to photograph because they aren't always moving. Even if they are moving, it's usually in the water or on the ground -- not flitting from branch to branch as you are trying to focus on them. I hope I've given you some new ideas on cultivating the birds in your environment or reminding you of something you've wanted to do but not done yet. Maybe today is the right time. 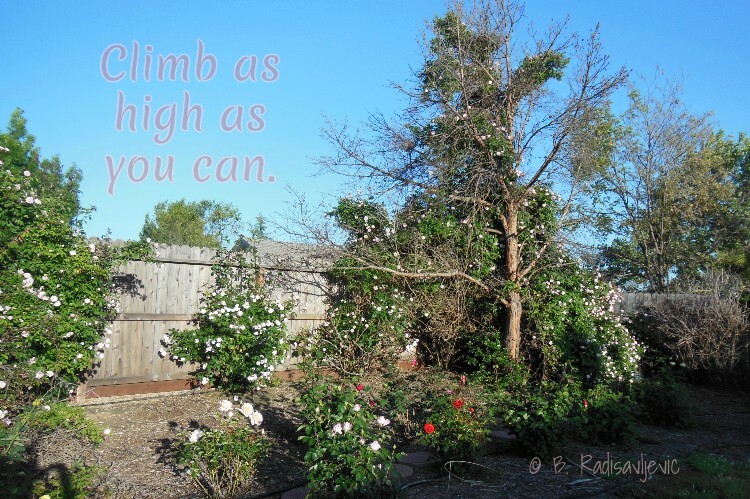 These roses used what they had available to climb as high as they could. In this case, it was a dead pine tree. Now it's become a trellis. The roses took advantage of the opportunity that presented itself and used it to get to the top. Is there an opportunity you haven't used that could take you where you want to go? We enjoy eating out, but our budget doesn't allow it very often. 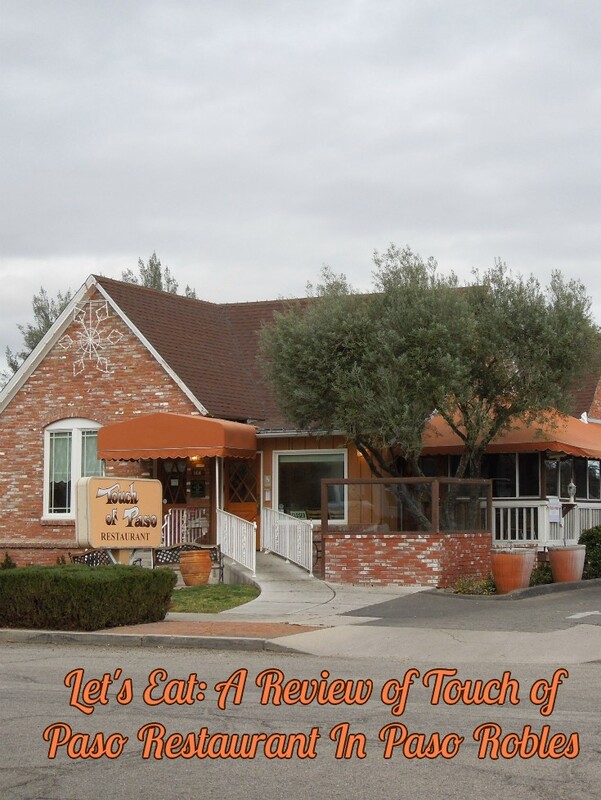 When we do eat out, we are most likely to choose Touch of Paso Restaurant in our hometown of Paso Robles. We enjoy the food, we can afford to eat there, and it's where the locals hang out. I chose this photo for this month's City Daily Photo Bloggers theme: Let's Eat. My husband, pictured above, loves Touch of Paso because he can eat the liver I won't cook. He likes the way they cook it. 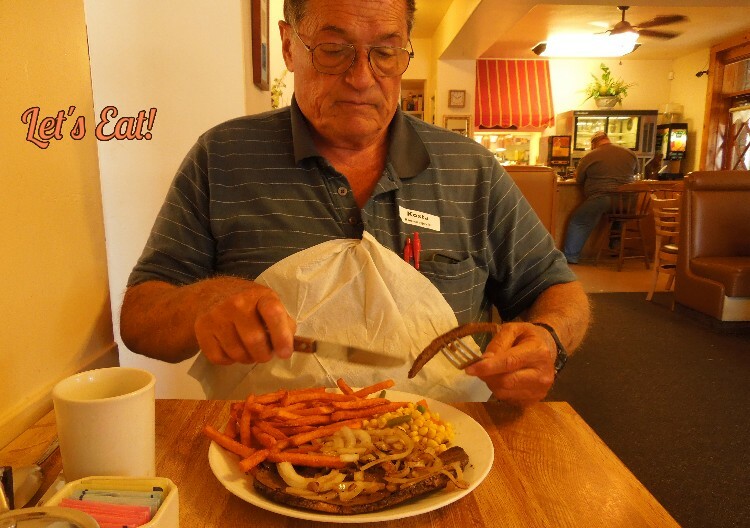 He also is glad he can still get sweet potato fries there, since so many other restaurants no longer have them. I normally order the Philly Cheese Steak on a French Roll. I get to choose two of these three options to go with it: soup, salad, or fries. See the complete lunch menu here. We normally go for lunch, but we have to get in before the restaurant closes at 2 PM. Those who want breakfast can get in as early as 6 AM. Touch of Paso also makes great cinnamon rolls and pies. Unfortunately our diet no longer permits us to eat them, but after a hearty lunch we really don't have room for anything sweet anyway. I usually take half my sandwich home for lunch the next day. Why Do We Choose Touch of Paso? 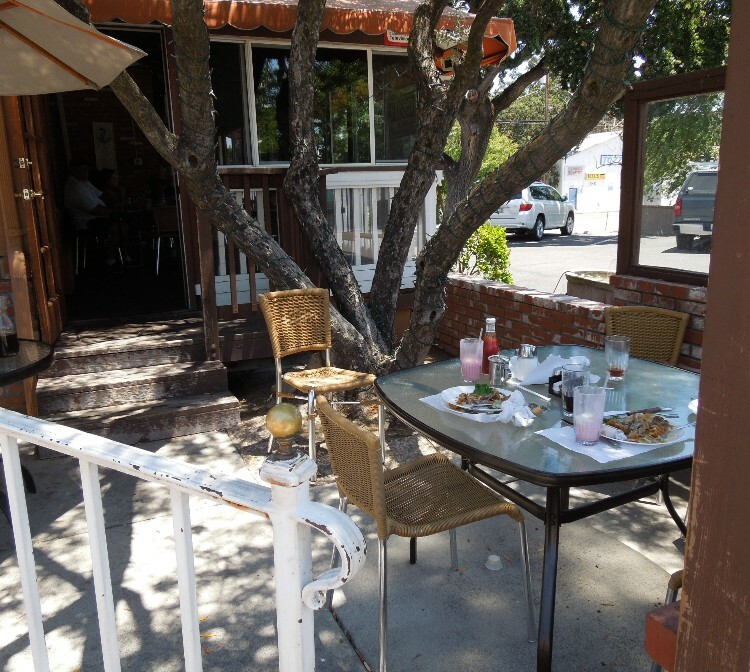 Touch of Paso offers a variety of choices for breakfast and lunch. Lunch options include early dinners for those who like to have their main meal at midday, as we do. Those main meal selections include "down-home" beef, steaks, chicken, and fish choices. 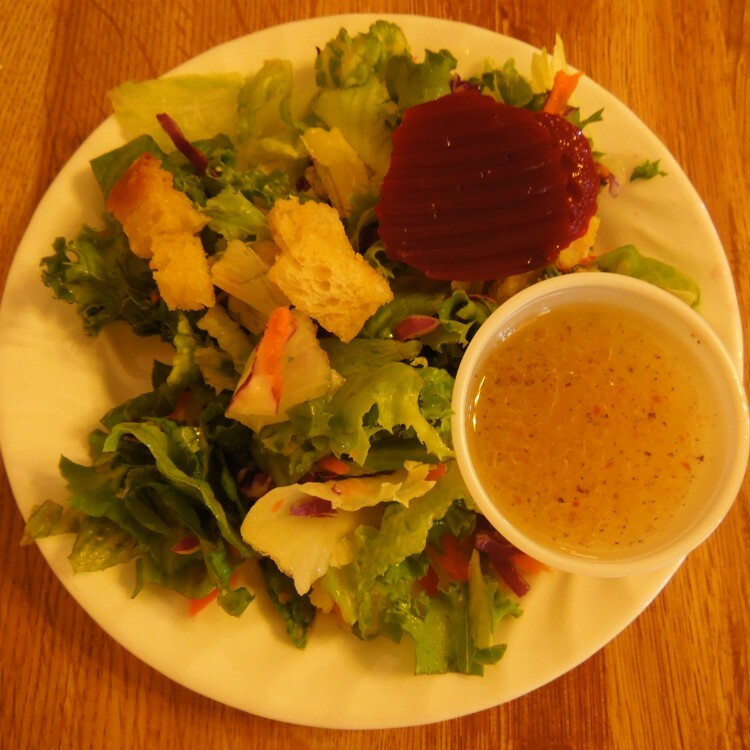 For a lighter meal one can order soup, one of the delicious main dish salads, chili, or one of several choices on the hot and cold sandwich menu. 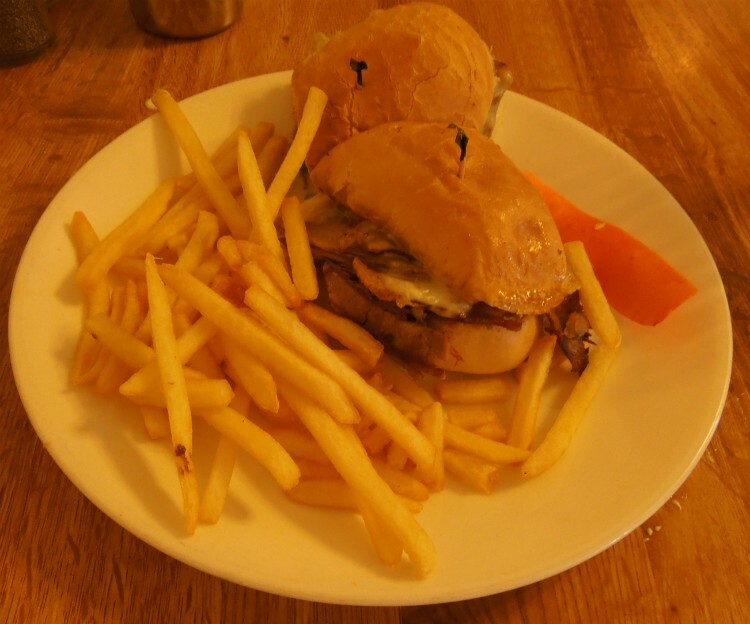 For lighter appetites, one can order a half sandwich with a cup of soup. Many people order this so that they have room left over for a delicious slice of pie. While you wait to be seated, you can browse the daily specials and the current pie selection from the boards near the entrance. 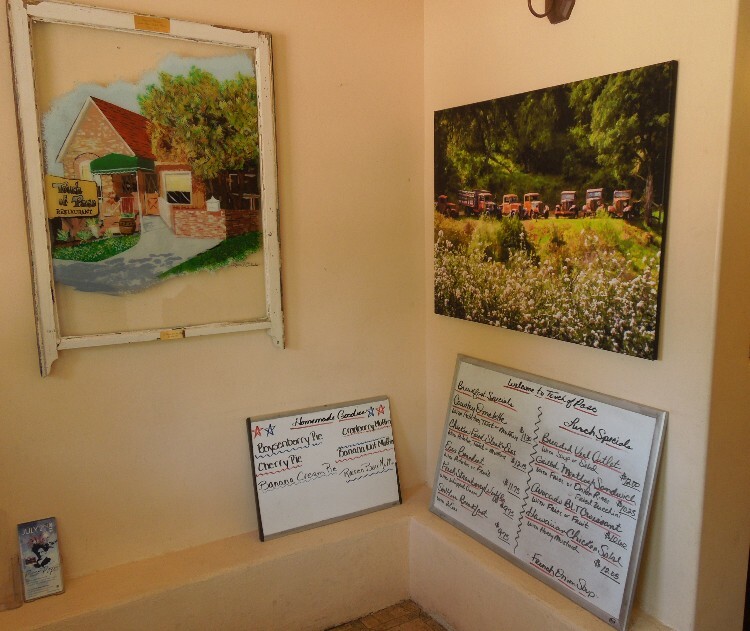 Local artist works decorate the walls both in the waiting area and in the dining rooms. This is a popular restaurant in Paso Robles and you might have to wait for a seat -- especially on Sunday afternoons. At Touch of Paso you have three choices. You can eat outside if there's room. You can eat in the sun room that looks out on the parking lot and the surrounding oaks. You can see its door above the steps that lead to the outdoor area pictured above. Outdoor eating space is very limited. The sun room is the next best thing. Of course, you can also choose to eat indoors, as we normally do. Indoors you can sit at a booth or a table -- whichever suits you or is available when you come. Wherever you choose to enjoy your meal, it will be a great value for what you pay for it. It's easy to take home anything you can't eat in one sitting, and we usually do that. Touch of Paso used to be a home, and the friendly staff will make you feel at home while you are there. There's a reason the locals keep coming back. 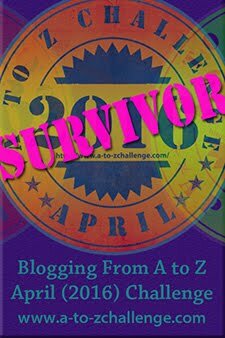 To see how bloggers around the world have treated this theme, see the theme gallery. All text and photos are © B. Radisavljevic, all rights reserved. Please do not use without written permission.